The Credibility-analysis is based on three assessment categories: ‘transparency’, ‘impact orientation’ and ‘stakeholder orientation’. The analysis is broken down to the issues identified as material in the sustainability reports. Hence, an evaluation per material issue is possible. Reporting on achievements and downfalls (as for instance accidents, not-achieved targets), as well as challenges and risks linked to the material topics. Whenever possible, negative or critical incidents should be mentioned, and the related causes, remedies and conse-quences should be discussed. 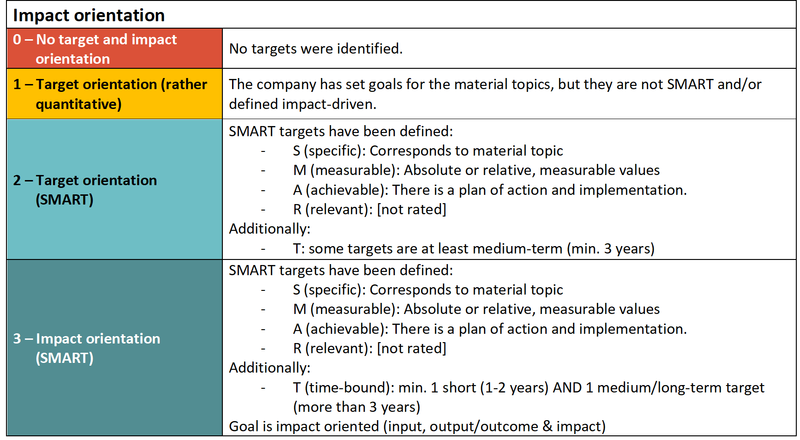 Commitment to short- as well as medium- and long-term targets that are SMART (Specific, Measurable, Achievable, Realistic, Time-bound) and ideally impact-driven. Disclosure of positive as well as critical stakeholder feedback (e.g. results of stakeholder dialogs or quotations of external stakeholders) regarding material issues, together with the company’s response. Each criteria was assessed between 0-3 points.